The journey to find the ultimate plate of Chileverde had a wonderful encounter at El Aguila Mexican Cuisine. Some of our best discoveries are by word of mouth and this discovery was by a fellow certified Kansas City Barbecue Society Master Judge Aaron. He mentioned this restaurant a while back and I recently saw an article about their cheesecake. Say no more. Mexican food and cheesecake are two of my favorite food groups. We ventured to El Aguila on a rainy day to discover parking Karma was in full gear evident by a parking spot right in front. The inside of El Aguila was packed at the noon hour which hopefully was a good sign. You place your order at the counter to receive a number for serving. The tables were small and placed close to each other. In fact I had to move from our original table because I was feeling claustrophobic and really did not want to hear about nearby Grandma’s sweet children. We now settled in to our small table and promptly our drinks, chips and salsa were delivered. These chips were not complimentary but always a necessary indicator of the meal to come. 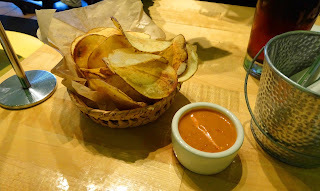 These were not traditional tortilla chips but potato chips. Thin potato slices deep fried and lightly salted. They were hit and miss. Some chips were greasy and limp and some were crisp and addicting. The salsa was a pepper and oil emulsion that was a touch over mild and pleasant. I have my fingers crossed for better things to come. We were not disappointed with our entrees. The Chileverde came to the table looking like it had jumped straight out a food magazine photo shoot. At first I did not really know what to expect. 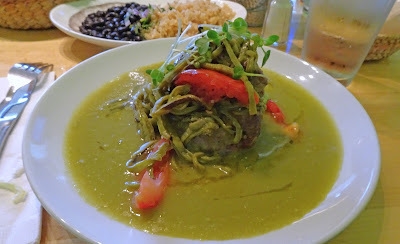 There was a mound of something with strands of something else all sitting in a pool of green sauce. The mound was a generous chunk of braised all natural Homestead Farms pork. It was tender and full of porky goodness. It was covered with strands of squash, ribbons of nopalitos (cactus) and grilled tomatoes. The green sauce was fresh and tart with mild chili love. This was a study in textures, flavors and scrumptiousness. Did I mention they were accompanied by house made tortillas and a plate of black beans with rice? Wow. 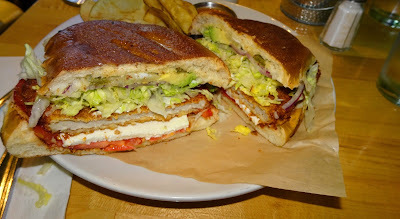 Ms. Goofy had a sandwich (torta). This was breaded chicken covered with melted cheese. Lettuce and lots of tomatos were also layered on this meat and all of it was served between two halves of a very fresh Mexican style bread. Ms. Goofy really enjoyed it. We then shared, well Ms. Goofy had a bite and I devoured some very decadent cheesecake covered with a caramel sauce. This was a wonderful stop on our journey to find the ultimate plate of Chileverde. It will be put near the top of all-time favorites. El Aguila Mexican Cuisine serves a high end rendition of some traditional Mexican dishes. 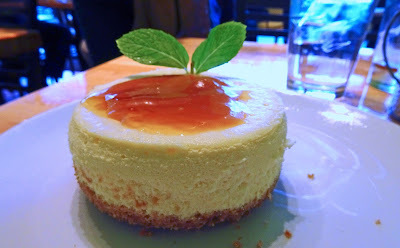 Today we award El Aguila bonus points for house made tortillas and decadent cheesecake. Our dishes were fantastic and will be worthy of return visits. The house made chips and seating arrangements were our only agitations to a wonderful meal. El Aguila is a keeper. Glad you enjoyed it- time for me to revisit!